Killer Characters: Follow Your Heart? It's so easy to say "follow your heart." Funny that it has become a popular saying. I hear it all the time. Nothing is ever quite that simple, though, is it? If we all ran around following our hearts, we'd be running roughshod over everyone else. A good number of years ago, my marriage began to melt away. We both knew it. We had drifted apart. My wife asked for a divorce, and I was agreeable. Of course, she didn't know that I had fallen crazy in love with someone else. I was a gentleman, though. I never let my feelings be known to my wife or my new love. And then one night while I was on a business trip in Miami, someone broke into our house. My wife was home at the time. She hid under the bed so the intruder wouldn't see her. He took some pricy items, but the biggest thing he stole was my wife's sense of security. She was never the same again. When I came home, she clung to me. After years of co-existing, she suddenly relied on me to feel safe. I became her security blanket. It wasn't as though she loved me again. It was more like she needed me. Of course, that put a quick end to the divorce. And here I am, in a loveless marriage, watching the woman I treasure and admire go about her daily business. I decided that my bed was made, and that I must do the right thing -- stand by my wife. It grieves me that she has become intolerably jealous when I have been loyal to her all along. I have done everything that I can for her, but lately, the rants and fits and screaming are wearing on me. I know she had the fright of her life the night the intruder came. I'm not a callous or heartless person. I'm still standing by her because it's the right thing to do, but sometimes, I wish I could follow my heart elsewhere. The characters here at killercharacters.com are giving away loads of free books this summer! Drop by every day to see what's new. 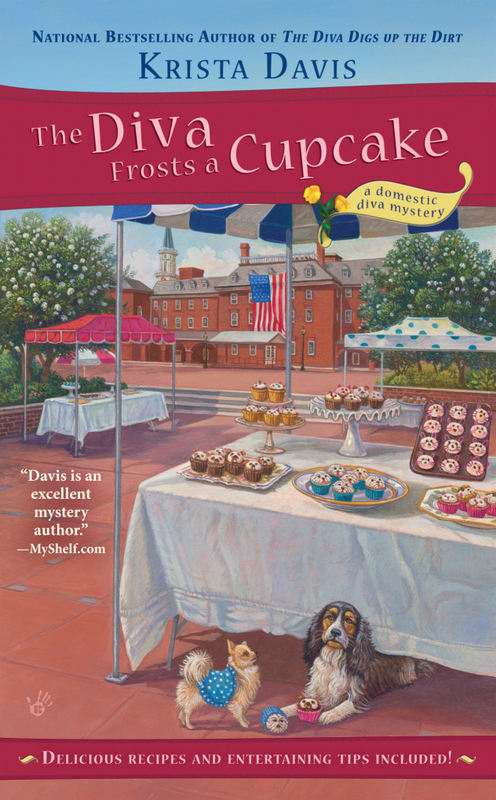 Sophie Winston of the diva mysteries has arranged for two copies of The Diva Frosts a Cupcake to be given to people who leave a comment. You have until midnight on June 23rd to leave a comment and be entered! Good luck! An interesting scenario....a main character who is in a marriage he does not want to be in but is helpless (at least at this point) to end it. But any book with cupcakes in the title has to make up for the main character's dilemma. Are there recipes and cupcake ideas? Dianne, there most certainly are cupcake recipes! I've tested them all. Chocolate with coconut, lemon meringue, applesauce spice with caramel frosting, fresh strawberry, and more! I have thoroughly enjoyed the Diva series and can't wait to read this one. Thanks, Krista, for your wonderful stories! I love this series - looking forward to the next book. Thanks. I am anxious to find out what happened between Sophie and Wolf. Can't wait to read this one! 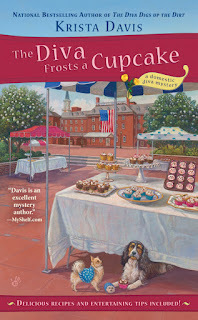 This is one of my favorite series and I am really looking forward to The Diva Frosts a Cupcake. I LOVE this series. So much fun to see Sophie and Nina in this book running the charity event. Also hoping that Sophie has a little more luck in the romance department from now on. It's too bad Spenser can't remember the reason he fell in love with his wife, maybe he would fall back in love with her. That is sad that he is living this way. Isn't the grass always greener on the other side of the fence? Absolutely devour each book you have written so far and I can't wait for the next. I love all the characters in your books and the crafting tips...Thank you so much for the entertainment. This is one of my favorite series. Each book is fun to read with the decorating tips. Eager to read this book! This is a new series for me...anxious to get started! I don't know how long it has been since the event Spenser, but someday soon you need to start over and file for that divorce. A loveless marriage is bad for both persons. Hm, I think the wife (and husband) are over-due for some counseling! The Diva Digs up the Dirt was one of my favorite books of last year. Can't wait to read the latest in the series! This is one of my favorite series. I can't wait to read the newest one. That's a good man. Ashame he is trapped in the marriage. I bet something good is coming his way. Love this series and can't wait to read the newest one! Just started this series and can't wait to read all of them. Great idea--one for me and one for a friend (that way they don't have to wait until I finish and pass it on)! That sounds so sad. I just know that things will look up. I love this series and was sad when Sophie and Wolf broke up. I can't wait to read this one and see what all the characters are up to now. A loveless marriage---that's a different scenario for a cozy mystery. I wonder how the cupcakes fit into this. Sounds like a very good read. I think everyone finds themselves in this situation from time to time, but if they look deep in themselves, they will see that the love is still there. I don't think you can really ever stop loving someone. Have not read any of your books yet. Now that I have seen this I will be looking for your books. I hope there is a "killer" recipe inside! Congratulations to our winners Cynthia Hogue and Mrs. GV!! Please send your addresses to Krista at Kristadavis dot com .